Increase Kindness, Citizenship, Cooperation, Tolerance, and Self-Esteem. Decrease Name-calling, Discipline and Distraction Incidents, Improving Safety. Inproving the Educational Atmosphere making it easier to teach and learn. 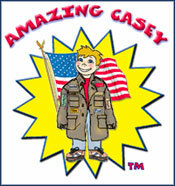 In a period of only six weeks, 96% of the traits can be introduced, brought to life, and practiced using the Casey story as a foundation – a powerful Character Education tool.